Susan G. Komen invests in innovative and ground-breaking global research to develop new drugs and therapies to treat, prevent and cure breast cancer. 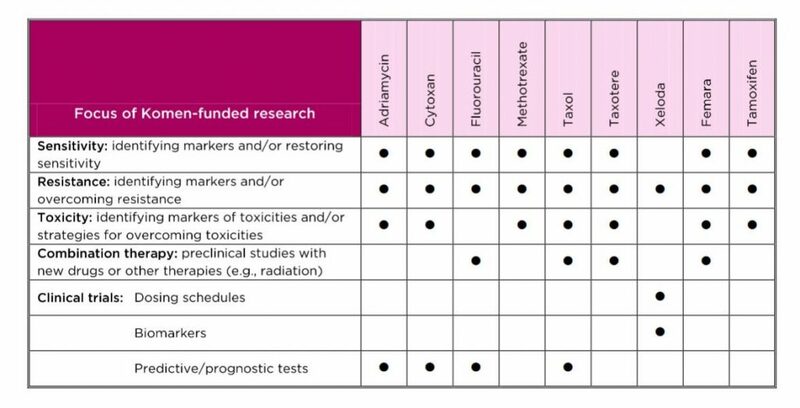 Over the years, Komen-funded research has laid the groundwork for many promising treatments – tamoxifen, arimidex, and herceptin – as well as the discovery of the gene indicators BRCA1 and BRCA2 for inherited forms of breast cancer. Our research focus has evolved over the years. In the beginning, we focused on understanding the basic biology of breast cancer. As we learn more about the factors that make cancer cells grow and spread, we have been able to invest more in the translation of this knowledge into treatment, early detection and prevention. Metastatic breast cancer of all sub-types. Every major advancement in the fight against breast cancer has been touched by Susan G. Komen research. We invest in science to find the cures. Susan G. Komen® Announces $31 Million in 2017 Funding for 98 New Breast Cancer Research Grants, with Focus on Aggressive and Metastatic Cancers. Since its inception in 1995, Susan G. Komen San Diego has invested more than $19 million to global breast cancer research and local breast health services. Susan G. Komen is the largest nonprofit funder of breast cancer research outside of the U.S. government. Nearly 40 percent of our research investment is focused on metastatic disease and much of that investment has been awarded to scientists in San Diego. Some significant discoveries in San Diego include a new therapeutic approach that could stop breast cancer from metastasizing and a diagnostic tool, called Lymphoseek®, that can more accurately determine whether breast cancer has spread to the lymph nodes, helping avoid over treatment of women and men with this disease. Locally, Komen San Diego provides free mammograms, biopsies, ultrasounds, MRIs, care coordination, education and financial assistance for breast cancer patients’ most critical needs during treatment. The organization also has a robust public policy and advocacy arm to ensure healthcare access and scientific progress. Komen has set a Bold Goal to reduce the current number of breast cancer deaths by 50 percent in the U.S. by 2026. Seventy-five percent of every dollar raised in San Diego stays in San Diego County to fund breast health services for uninsured and underinsured men and women, and their families. The remaining 25 percent funds international breast cancer research. For more information, please visit www.komensandiego.org. Connect with us on Facebook and Twitter and Instagram.